* StarShipSofa's episode with the nominees for this year's British Science Fiction Association Award for "Best Short Story" is now available, and it includes my narration of Aliette de Bodard's "The Shipmaker." * The second of my two interviews with KosmosOnline Podcast, this one on the themes of liberty in Joss Whedon's Firefly and Serenity, is now available here. * Underworld will be releasing a soundtrack album for Nick Dear's new Frankenstein play. 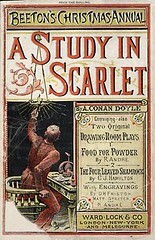 * March 4, 2011 marks the 130th anniversary of Sherlock Holmes's investigation of the "Lauriston Gardens Mystery," aka A Study in Scarlet. study130 is a new community celebrating A Study in Scarlet (and its modern incarnations, including Neil Gaiman's "A Study in Emerald" and the BBC's Sherlock episode "A Study in Pink"). * When oh when is the second series of Garrow's Law going to be available on US DVD? We inhaled the first series, and now we need more. * Happy early birthday wishes to clara_posts! May you enjoy your day and a wonderful year to come. That Lovecraft link was hilarious. I myself am fond of Antediluvian, Foetid and Daemoniac. But I can certainly see where Hideous got first place. Podcasts? More? Oh, yum!!! My iPod loves you. No, thank YOU. I've listened to your narration of "The Shipmaker" now, and it's beautiful. One of the best I've heard you do on the Sofa. Oh wow - you have no idea how much that means to me. Thank you, from the bottom of my heart. I felt like I made a nuisance of myself, but when I read the story, I was struck by all the different names/terms in different languages that I simply couldn't find preferred pronunciations for in any of my print or online sources. I ended up making a list and contacting the author (who was wonderfully supportive and incredibly knowledgeable about linguistics, obviously), asking for a guide. Because she'd done such a thoughtful job of giving the reader cues about how she'd combined/represented the cultures, I really wanted to do the best I could to honor that -- and to not mess it up! LOL. So I'm really grateful for your kind feedback. Wish I was able to make Stellarcon; sounds like it will be a blast! It was great fun! (Except for the strep throat I brought back with me.) The Blibbering Humdingers' concert was an especially high point. Much Hufflepuff goodness! Speaking of which, I look forward to seeing you soon. A quick look at the prophecies on page 22 of the Classic Comics edition of the Necronomicon shewed — excuse me; showed us what we could expect: when the stars were right, it said, it was just remotely possible that a movie could be made from the writings of H.P. Lovecraft that didn't stink with the noisome foetor of shoggoth poop.